It was a fine way of starting off the new year. People from all over Floyd County were greeting friends and making new ones at Mac and Jenny Traynham’s farmhouse in Willis. Mac and Jenny were hosting a house concert by the Hushpuppies, a Greensboro, NC, old-time music revival band. It was an evening to remember, a full house of music lovers, lively tunes, and a bountiful spread of pot-luck refreshments. The Hushpuppies entertained the packed house with old-time and gospel music they have learned from elderly fiddle and banjo players throughout the South. All four musicians sing and play several instruments. They are talented and likable entertainers. From left to right in the photo, they are Molly Stouten, Jon Newlin, Amy Davis, and Steve Terrill. You can find out more about them and their music here. They have a refreshing naturalness about them and they manage to integrate tunes from many sources into a style that is very much their own. From rousing dance tunes to wry musical commentaries on life, this talented quartet held the audience spellbound from their opening notes to the final flourish. They shared the histories of the songs and told us about the musicians they had learned them from. They also invited the audience to sing along with them and there were many who joined in on the old time songs. People were happily singing along to tunes I had never heard before! 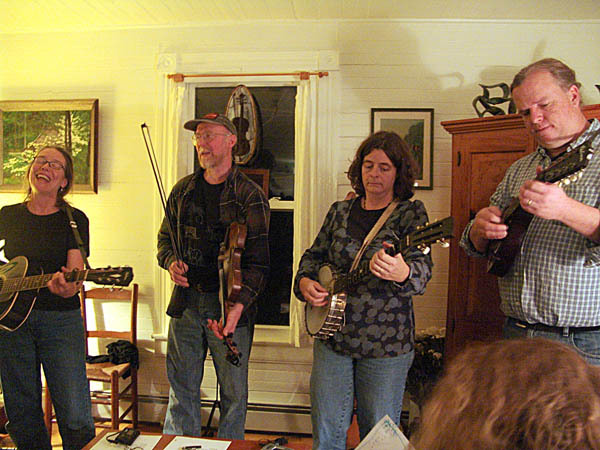 House concerts are becoming an increasingly popular venue for musicians and audiences alike. 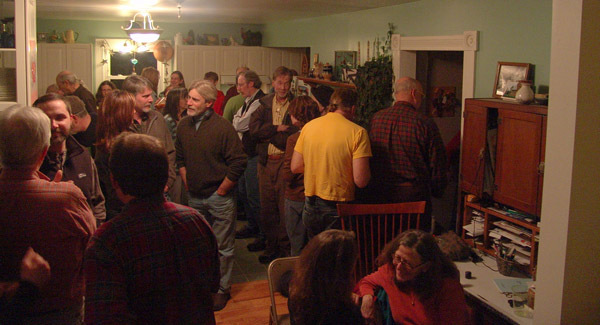 House concerts are hosted by fans in someone’s house or private space. Donations are requested and go directly to the performers. CD sales are an important part of the evening for performers and the audience alike. Everyone benefits. The audience gets to hear music performed in an intimate environment and can actually chat with the performers on a personal basis. In a house concert, the musicians get an attentive audience that is there to hear the music and they find house concerts to be more financially rewarding than playing cafes. If you would like to find out more about house concerts, perhaps to put on one of your own, talk to Mac and Jenny Traynham or Google "house concerts". There is a lot more information available on this do-it-yourself concert phenomena. This entry was posted in Country Living, Music, Simpler Lifestyle and tagged Amy Davis, Greensboro NC, Hushpuppies, Jenny Traynham, Jon Newlin, Mac Traynham, Molly Stouten, ouse concert, Steve Terrill. Bookmark the permalink. nice resource for you and anyone interested in house concerts. 300 hosts – 500 artists – and all you could want to know about house concerts. Breton dancing was, allegedly, first devised as a means to stamp down a neighbour’s earth floor inside his cottage. Now that the awful laminate floor in my soon-to-be-bedroom is no more I feel inspired by this post to introduce a new Breton dance called The Board Shine. Entry is free, all are welcome, please wear a polisher on your feet!